A few weeks ago I told you about my latest attempt to learn a new skill that I should probably already know by now: riding a bike. Well, the first lesson was somewhat of a success. It was half an hour of bulging eyed panic. Nevertheless, I persevered the next weekend and within the next half hour, I was riding a bike by myself. Okay it was on the kid's track and I was mentally content to ride around that for a while until I kept getting overtaken by kids (by kids!!!) and I realised that I was getting in their way and that they were wondering why the adult was on their track. Moving myself from the kid's track, I managed to go around the adult's bike track at Centennial Park without too much of an incident. I did get very anxious when a car would drive up past me thinking that they were headed straight towards me but eventually realised that they would pass me. Thankfully there was no crash and I sort of got the hang of gears (sort of I say, I think I understood them in theory but not in practice). The whole point of learning about this was so that I could ride a bike in Bangkok on our holiday so that I could see more of the city. Unfortunately, we had left the lessons too late and with only an hour and one loop around Centennial Park under my belt, we realised that the crazy city of Bangkok was not the place to try my newfound biking skills. But never one to give up, Mr NQN found a bike rental place at a nearby park and we went for a ride. Except I was quite unprepared. I was wearing a dress and ballet flats and back in Sydney I would only ride with full protective gear-hell I even wanted to wear a sealable air bag costume! Mr NQN rushed over I had only gone a few metres and suddenly I was among the bushes, my left ballet flat was broken but above all, my imaginary fantasy of riding a bike and my pride was hurt the most. I have no more spectacular sporting feats to share with you but I do have this spectacular cake that may I suggest might be just right for father's day coming up. It's actually a combination of two cakes. The first was one that Queen Viv brought to my house for a dinner party one night. 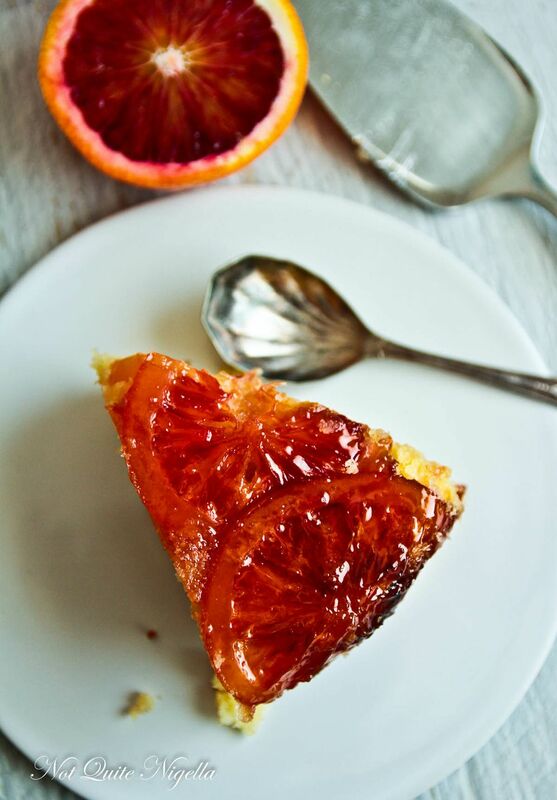 It was made with blood oranges, those spectacularly coloured but short season citrus fruit that is currently in season. 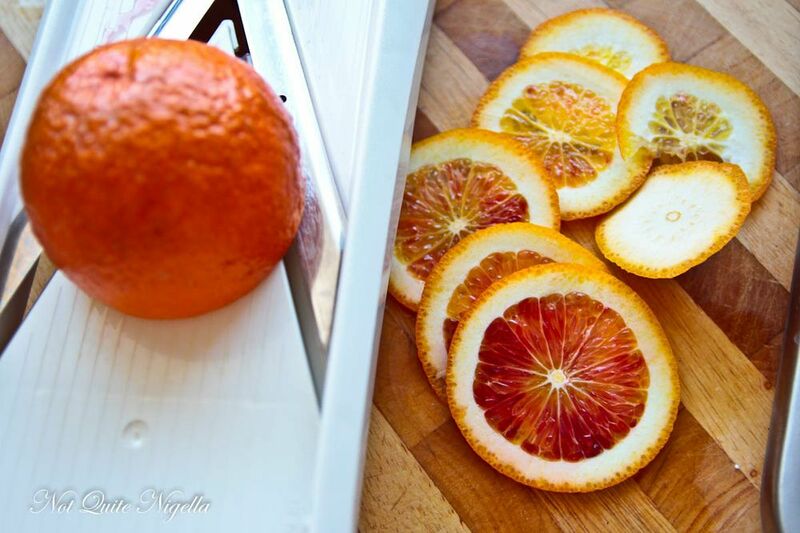 She explained the process of tiling the blood oranges so that you got a magnificent effect. She even loaned me the gold plate that she had brought it on for photos. The base of the cake is actually from a quince cake by lovely reader Jaqi. She made me an upside down quince cake and it was beautifully soft and moist. 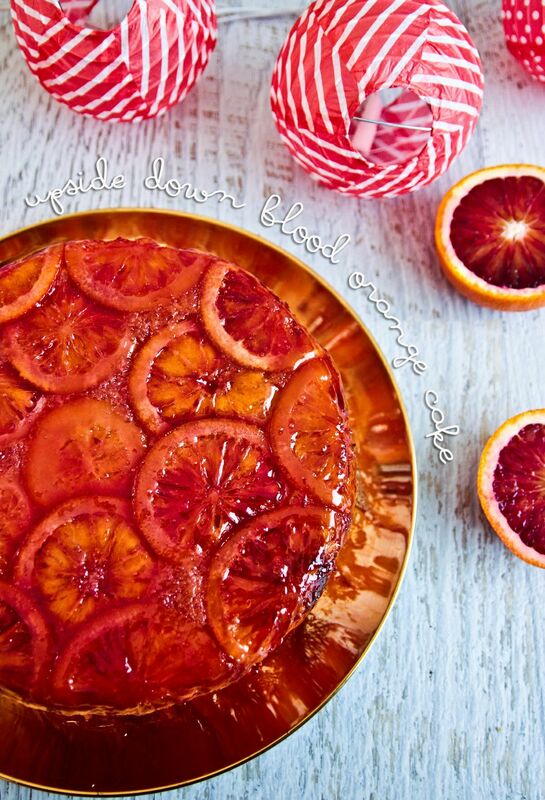 I could only find quinces for a very expensive price at the local store even though they were in season so I decided to combine the two concepts and make the one cake-the blood oranges from Queen Viv and the base from Jaqi. Don't think that this is a hard cake at all. 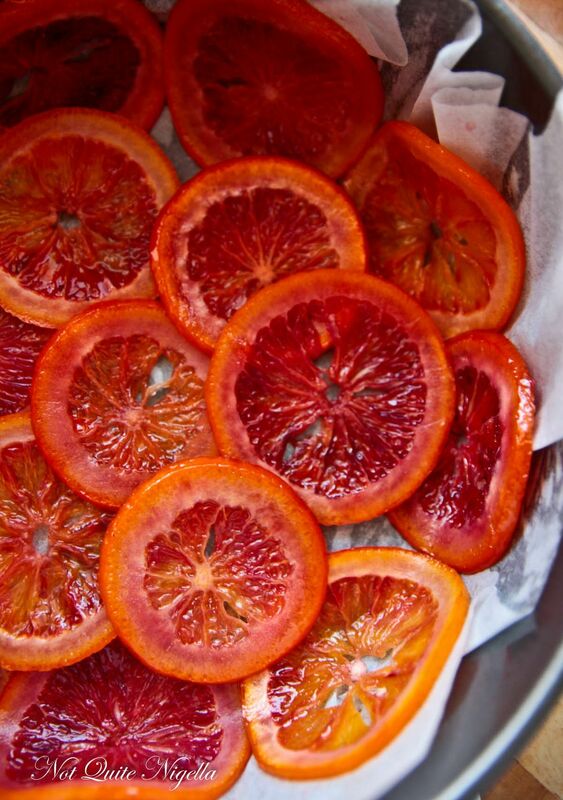 The blood oranges are like making an icing or decoration-in fact they're easier than you would realise. And the base is fantastically easy but produces the perfect cake for an upside down one. It bakes perfectly flat so there's no need to trim anything. All you do is bake, cool a little and then flip and glaze. 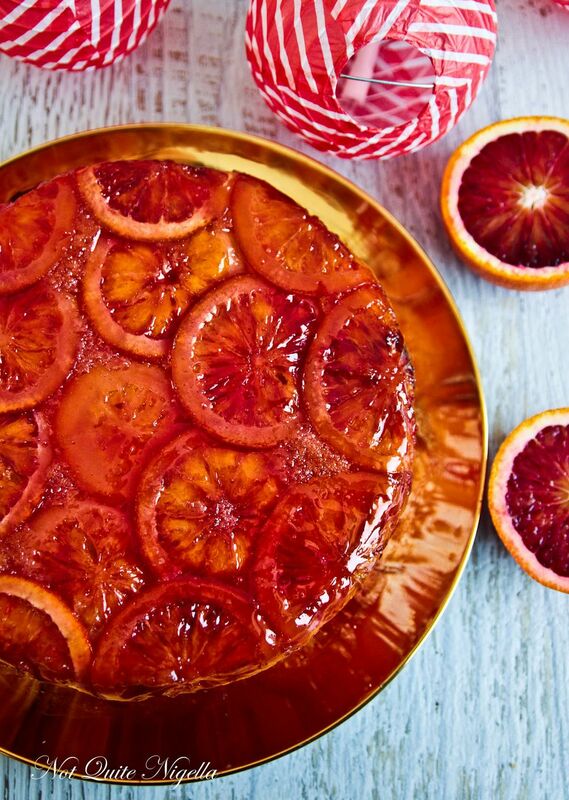 I promise you that this is spectacular to serve to anyone and Queen Viv has even made this with regular oranges tinted pink when she can't get blood orange and it still looks beautiful. Step 1 - Preheat oven to 160C/320F. Line 25cm cake tin (I use springform) with baking paper in one piece folding down the sides (as shown). In a saucepan, place the water and sugar and stir on low to medium heat until melted. 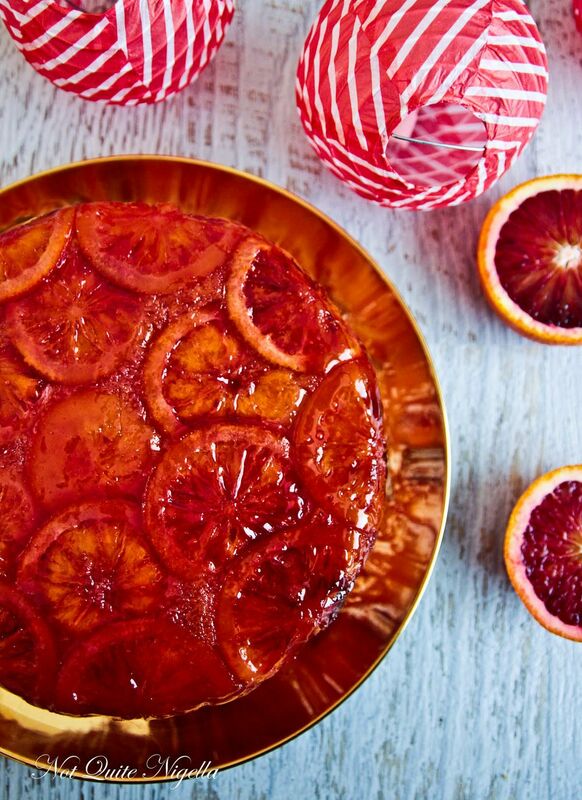 Turn up the heat to medium high heat and add the blood orange slices. Once boiling, simmer for 10-15 minutes until the peels become semi translucent. 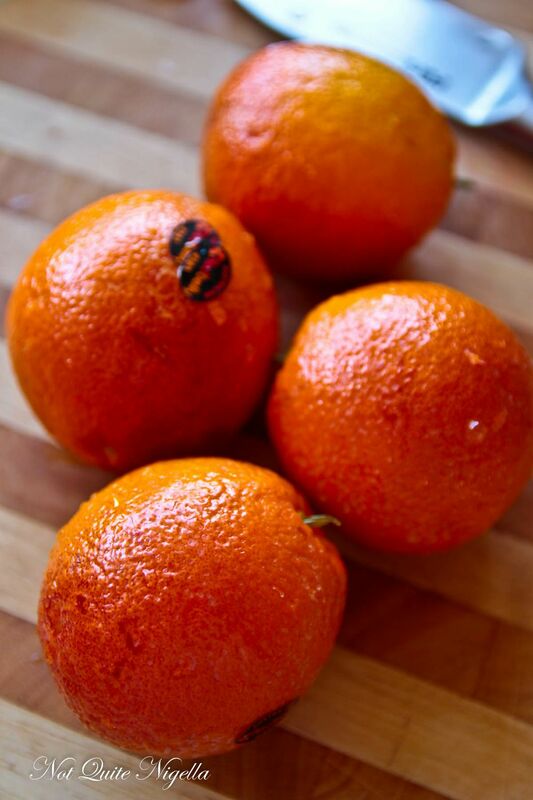 Remove the orange slices with a slotted spoon and boil the syrup so that it becomes slightly thicker. Cool the oranges until they are fine to handle with hands. Step 2 - Line the sides of the prepared tin using some of the syrup brushed onto the parchment to adhere them. Queen Viv suggested first putting down the ones that curve around on the side first and then tiling them around that. You can overlap them too and I wanted the orange slices all the way to the bottom so I cut some in half and placed these on the top edges (which when overturned will become the bottom edge). These were the peskiest to stick but persevere using the syrup which gets nice and sticky once cooled. Reserve the syrup to brush over cake once baked. Step 3 - In the bowl of an electric mixer, cream butter and sugar until light and fluffy and add eggs one at a time. 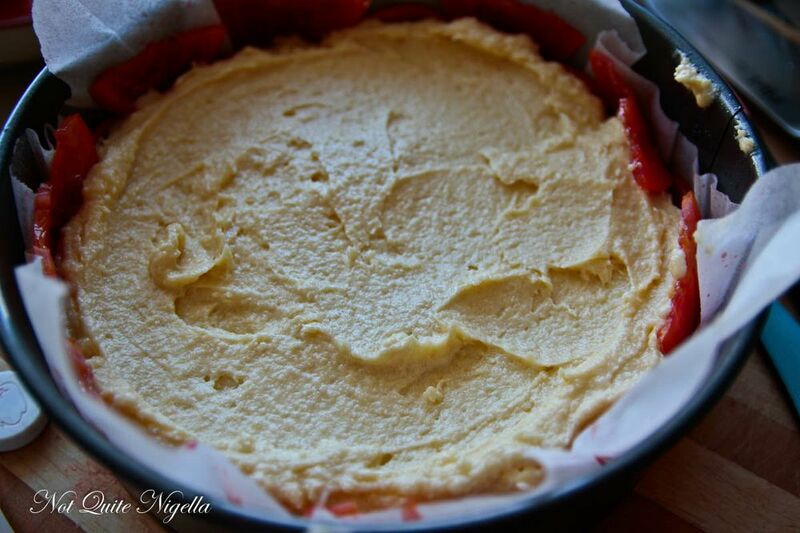 Stir in almond meal, flour, baking powder and yogurt and mix until just combined (do not overwork). Spoon into the prepared tin making sure not to dislodge the orange slices. Bake for 60 minutes until a skewer inserted comes out clean. Step 4 - Cool in the tin for 5-10 minutes. The longer you cool it the sturdier the cake will be. 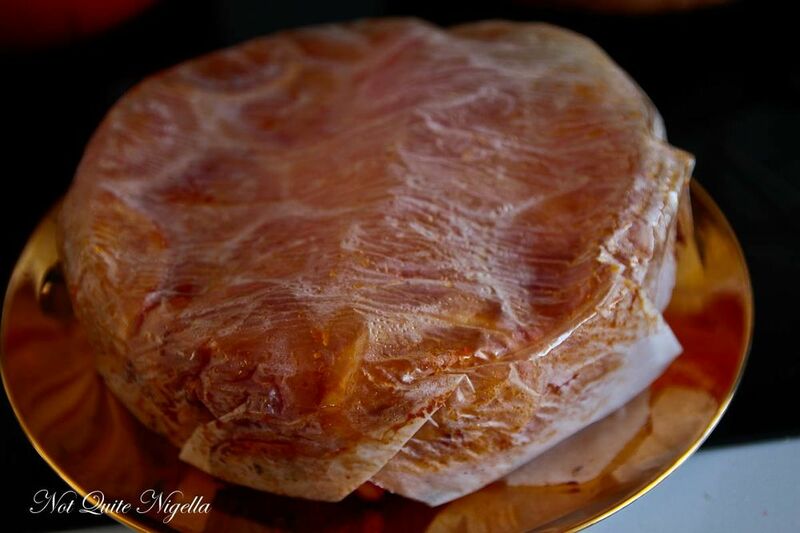 Upturn carefully onto the serving plate and remove the parchment paper. 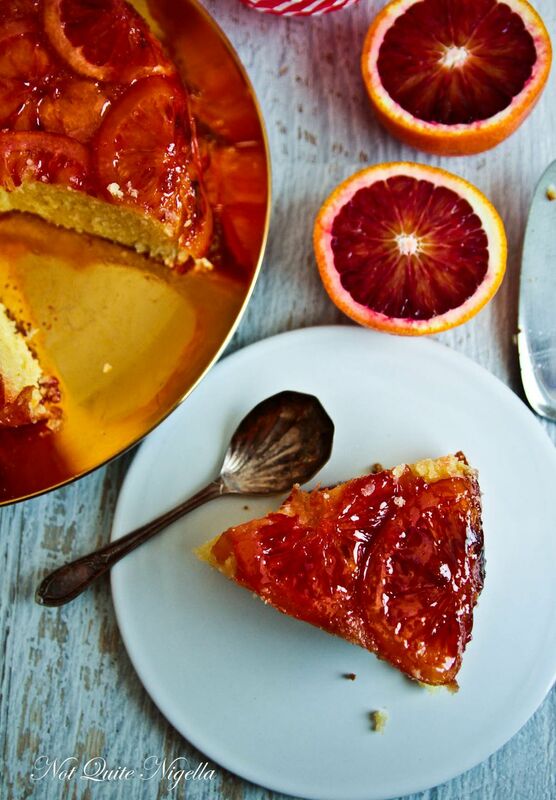 Brush the top and sides of the cake with the reserved glaze. Serve with double cream or thick yogurt. featureBanana Skin Cake. Yes, really! featureSprinkle Cake & A Book Update! feature Banana Skin Cake. Yes, really! feature Sprinkle Cake & A Book Update! feature Celebration Stained Glass Cake!